Louise C. Weston, Environmental Strategies, Inc. This article reports on the results of a recent practitioner survey in which respondents were asked to identify the three most important issues facing the discipline of sociology at that time and five years into the future. Respondents were drawn primarily from the Sociological Practice Association and the Sociological Practice section of the American Sociological Association. Responses are discussed both within and across membership affiliations. 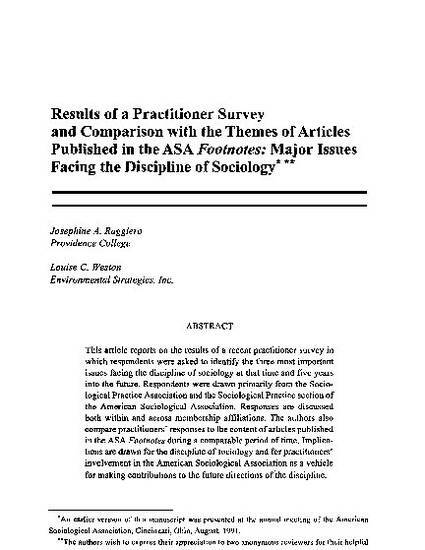 The authors also compare practitioners' responses to the content of articles published in the ASA Footnotes during a comparable period of time. Implications are drawn for the discipline of sociology and for practitioners' involvement in the American Sociological Association as a vehicle for making contributions to the future directions of the discipline.